Being an almost middle class kid back in the 70s coupled with being raised by Baby Boomers who in turn were raised by Depression survivors, I never ate out very much until I was able to drive on my own. Fortunately my parents and grandparents all had mad skills revolving around a kitchen stove, grill, and a pot on a certain outside Coleman stove filled with fresh caught shrimps and crabs so I did not suffer. Except regarding BBQ sauce. See both my grandparents and the Big Guy were absolute loyalists when it came to certain brands. My Pop swore by his hidden bottle of Crown Royal. My Grandma refused to budge on anything but Karo syrup in her pecan pies. My mother insisted on Donald Duck brand orange juice (though in all honesty I later discovered that was more of a budget thing). 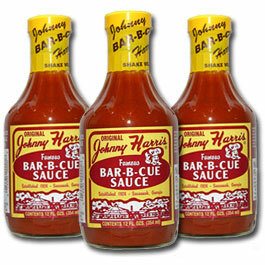 My Pop and the Big Guy became a dynamic tag-team grilling duo that the only real BBQ sauce was Johnny Harris Restaurant's in house made sauce. My father would just look at me as I would gobble down pulled pork soaked in Heinz Honey sauce like I was a cretin. As awesome as the Big Guy was, there were just some things you did not do in our home and go against the grain was one of them. In my defense, I had an unrefined palate powered by a subliminal effort to inject as much sugar in my bloodstream but then name one 7 year old who doesn't. 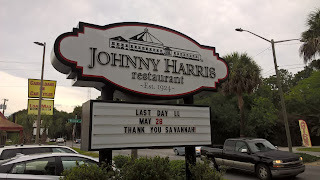 As a result,I have never been much of a fan of eating at Johnny Harris's Restaurant. Before you say it, I know. I know. How can you be this die-hard Savannah Guy and not heap praise on this local landmark? Since my return to the promised land back in 2007, I have eaten there a few times. 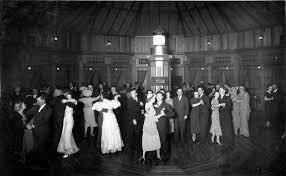 Each time I enter, I am enthralled by the dark polished wood, the ingrained smoke scents, and of course the ballroom. At 92 years old, the place literally sweats history. Unfortunately, I never dug the sauce and until recently had not been in to eating BBQ which thankfully, I've recovered from that last bit. Last Saturday morning, I had to make a quick run downtown to pick up some dialysis supplies and while driving up Victory, I spotted this. 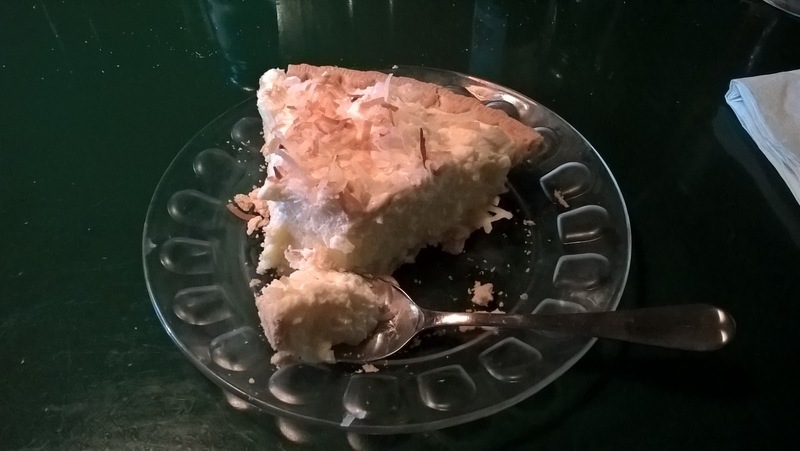 Earlier in the week, Lyndy Brannen on Quality Rock 105.3 had broadcasted on the air about dropping by to grab a lamb sandwich and a slice of coconut pie. Two items I had not tried and was intrigued. As I drove by around 11ish, I realized it was the 28th and my last chance ever to try what many locals refer to as a Savannah staple. Even at 11 o'clock , the line was already out to the street but we all waited patiently for the next thirty minutes and got to chat with many of the people in line near me. 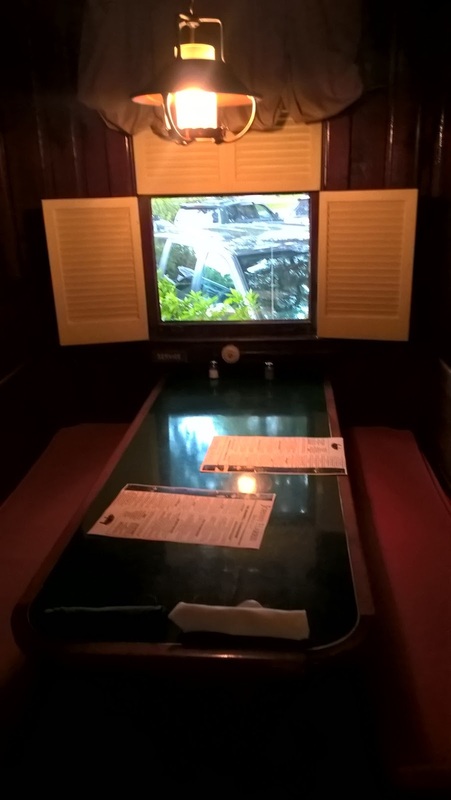 Most of them were much older and had great stories about dining here after high school football games, wedding receptions, and one elderly couple even had their first date here. All the news crews were out in full force. WSAV did pretty good report. See if you can catch a certain local storyteller wannabe who had no idea he was caught on camera until he previewed the clips. Click here. Over the past nine years, I've probably been in JHR around a half dozen times. Every time, I try sit in the main dining room just for the ambiance and I always think the same thing. "How often did Grandma and Pop come in here and did the ever dance in the ballroom?" The dome like ceiling makes the acoustics perfect which was why the Savannah Songwriters would perform here all the time. 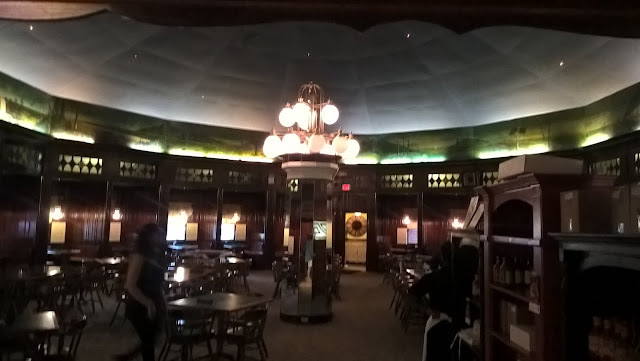 Plus the ceiling had tiny white lights to give the illusion of stars at night, Unfortunately, I was using my cell phone and could never quite capture the shot just right nor could I find any on the net. Sorry. This is my booth. Every time I've come in to grab a bite, I always feel like I'm walking back into the 40s and need an Old Fashioned in my hand along with my best girl at my side and a mystery to solve. It's a shame there are not more places like this here in Savannah where it still feels the same as it did fifty-sixty years ago. 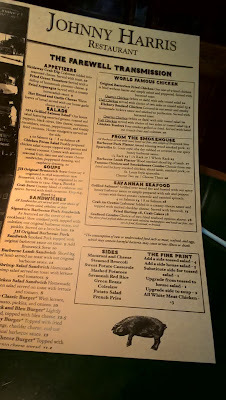 My server handed me a special menu for the last day proclaiming, "The Final Transmission." Younger Robby would have figured a way to smuggle this menu out of JHR. Older, Present Day Robby was in too much of a Carb Coma to make an attempt. So I ordered the lamb sandwich after a bowl of Brunswick Stew. At first, I almost just opted to do the lamb platter because the description for the sandwich read, " sliced leg of lamb served on toast with our original BBQ sauce." The Savannah Foodie in me began to scream how could a sandwich be any good on plain toasted white bread and also that sauce? Fortunately something told my snobbish foodie shelf to take a long walk off a short dock and give it a go. Man, I am so glad that I did because that lamb sandwich was outstanding. It was so tasty, I had eaten most of it before I I realized I had forgotten to take a picture. And the sauce? Call it being caught up in the moment of saying goodbye to a Savannah landmark. Call it growing up and learning to let my palate enjoy different flavors even if they were so simply combined, but I loved. JHR sauce will never necessarily be my fave (that slot is allotted to B's Cracklin' BBQ ) but I am buying a bottle the next time I hit Kroger. As I walked out roughly an hour later, I felt a little sad. Because of a childhood prejudice towards BBQ sauce, I had let the opportunity to enjoy something people much smarter than myself have been raving about for decades. Sadly, I found that one menu item that would have brought me back again and again on the very last day. #RobbyOutsmartsHimselfAgain. Oh well, live and learn. This meal much like the Big Guy, also put me in my place. It's interesting that in a time where I pat myself on the back for having such a refined palate because I enjoy items like the pavlova at Savannah Coffee Roasters or the spicy black beans at Tortuga's Island Grille that a simply made smoked meat sandwich on toasted white bread that would stick out like it did. It's lesson to remember in which good food does not always have to be fancy food. Oh, and JHR did serve a mean slice of coconut pie. I did manage to get a shot of that before attacking my dessert. Don't mind if I do!!!!! That wasn't a special last day menu. 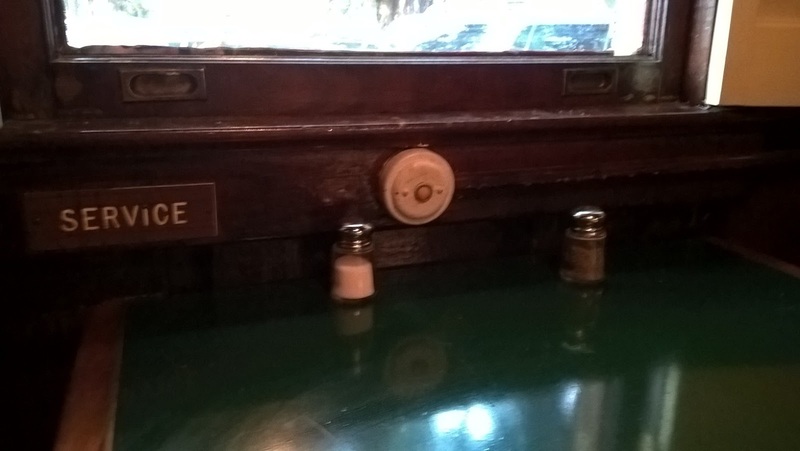 That's the same they have had for years..
We went around 4pm and the bar room was dead. We could see a small line up front around 5pm. Either everyone wanted to sit in the ballroom or nobody knew you could just walk in the back and sit in the bar.